I was introduced to Afternoon Tea in the late 1990s. That was when my partner and I made several trips to London. Our dear friend Harold Brown, who, at the time, was Princess Margaret’s butler, often invited us to tea at his fabulously-decorated flat at Kensington Palace. And other tea-excursions were enjoyed at Richoux on Piccadilly Circus, and at the home of author Hugo Vickers and his lovely wife Elizabeth. All these teas had something in common, regardless of venue. 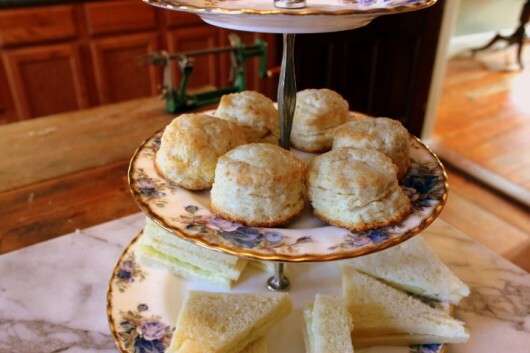 The finger-fare was served on a 3-tiered stand, with cucumber (or watercress or smoked salmon) sandwiches placed on the lower rung; plain scones on the second; and sweet “somethings” on the top rack. As for the tea itself, it was loose, not bagged. The English — at that time, anyway — were appalled at the thought of cheap, bagged tea. Good for them. Let’s start with the Cucumber Sandwiches. For these you’ll need a loaf of French Sandwich Bread, or Pain de Mie. 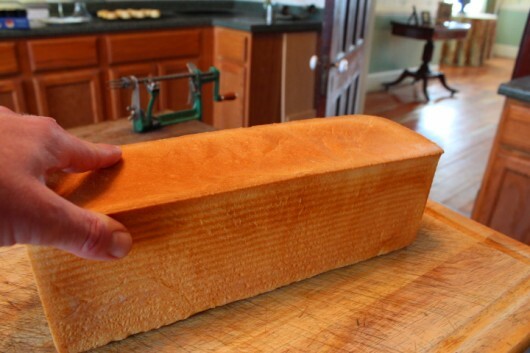 I make Pain de Mie in a covered “Pullman Pan” in order to achieve a perfectly rectangular loaf (pictured above) that can be sliced very thinly. Here’s the recipe. 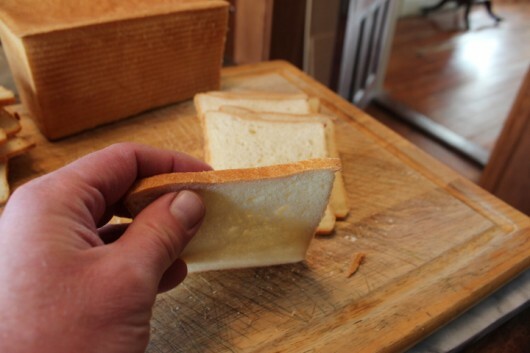 If you don’t have a Pullman pan, you can always make the same bread in an ordinary bread pan. Just weigh the top down with a baking sheet and a couple of bricks (or a cast-iron pan), as described here. 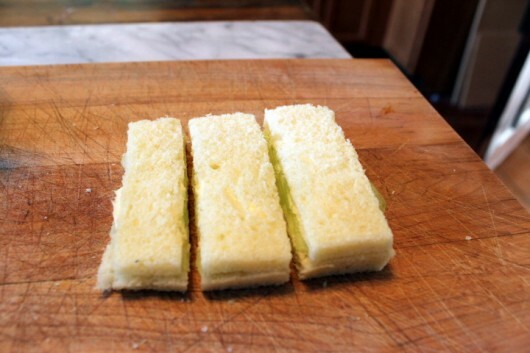 Cut the bread into 1/8-inch slices. Then remove the crusts. 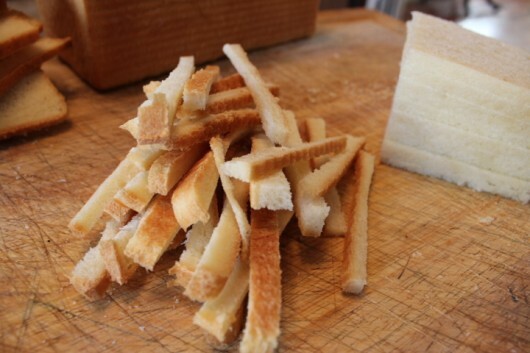 It’s really easy to remove crusts from a rectangular loaf of bread. Oh. 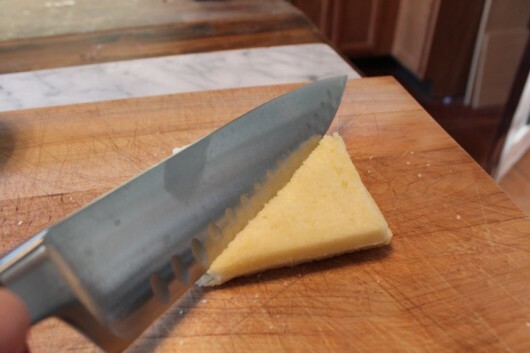 Be sure to save the crust-trimmings. You can freeze them for stuffing, or grind them up for bread crumbs. 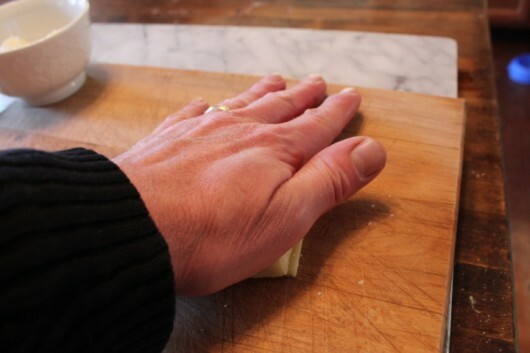 Spread two slices of bread with softened butter. 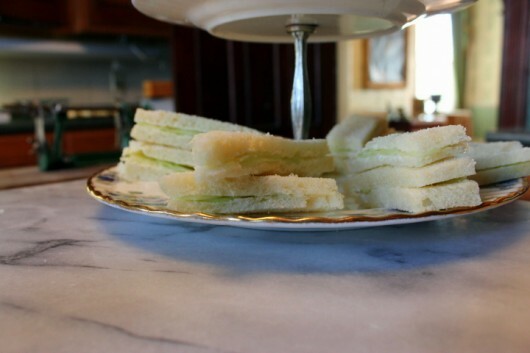 Traditional cucumber sandwiches are not made with mayonnaise or any other kind of spread. 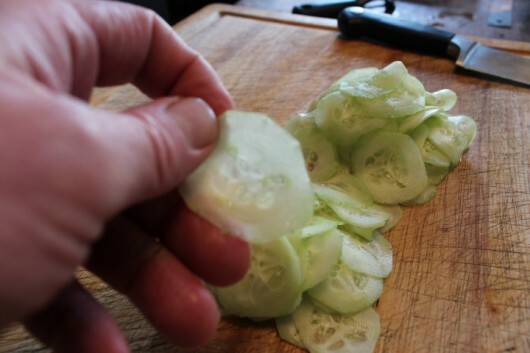 Now peel a cucumber, and cut it into paper-thin slices. 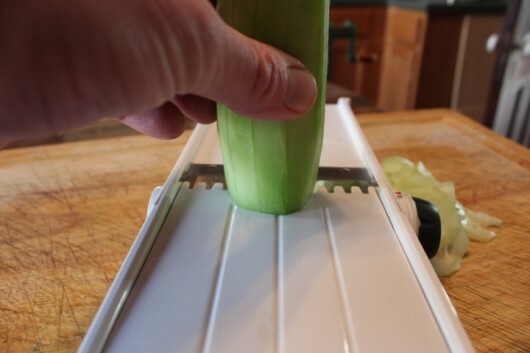 I use a mandoline (pictured above) for such slicing-jobs. You can pick up a mandoline at any kitchen supply store. It is not an expensive gadget. I cut my slices so thinly that you can see daylight behind them. Oh, the things I do for you. But I don’t mind. I value our friendship. 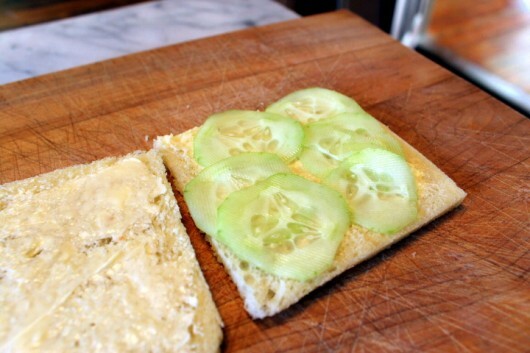 Place a single layer of cucumber on one slice of the buttered bread. You could add more than one layer, but then the cucumbers might fall out when you take a bite. And then you’d lose your air of dignity. Sprinkle a tiny pinch of salt and freshly-ground black pepper over the cucumbers. 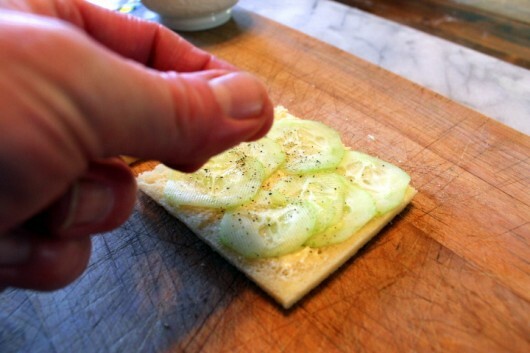 As further insurance against wayward cucumbers, flatten the sandwich with your hand. And other sandwiches into rectangles. Rectangles, I can assure you, present themselves very nicely at tea time. Arrange the tea sandwiches on the bottom rack of your 3-tier stand. What’s that? You don’t have a 3-tiered stand? Then arrange the sandwiches on your prettiest platter. And then promise me you’ll buy a 3-tier stand. Believe me, it won’t go the way of your Fondue pot. You’ll use it every time you serve Afternoon Tea. And that should be at least once a week, my dear. Arrange fresh, homemade scones on the second tier. And by “scones,” I don’t mean the big, clumpy things that contain cranberries, currants or raisins. Traditional English Cream Scones are small, delicious, and plain. I make them this way. And what to place on the top shelf? Well, something sweet, but tiny. 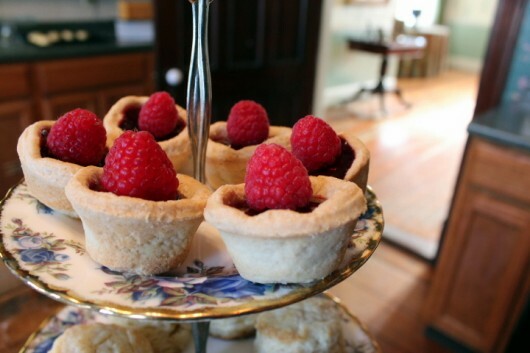 I purchased little jam-filled tarts from my local bakery, and topped each one with a fresh raspberry. Please forgive me for cheating this way. Next time I serve you Afternoon Tea, I’ll make my “sweet somethings” entirely from scratch. And that’s a promise. To make the tea, first pour a few inches of boiling water into the tea pot. Swirl the water in the pot, and then pour it off. The boiling water is meant to warm, or “prime,” the pot. 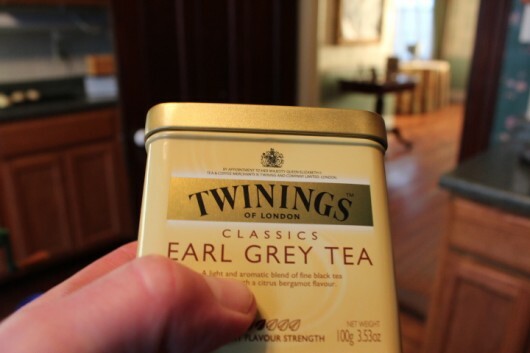 And by the way, we’re having Earl Grey tea. I hope that’s alright with you. The tea is infused with oil of bergamot, which gives it a beautiful, floral scent. 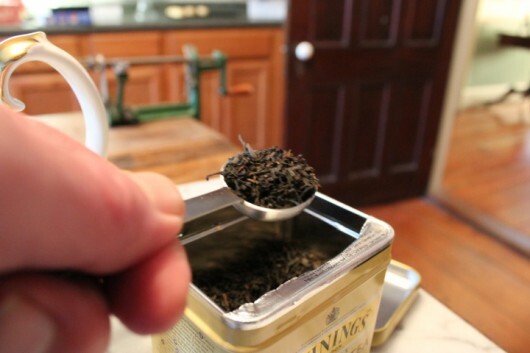 You can simply place the tea leaves in your pot, and then add boiling water. 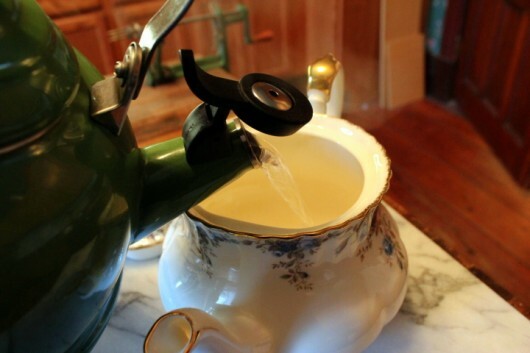 But then you’ll need a tea-strainer when it comes time to pour the tea. 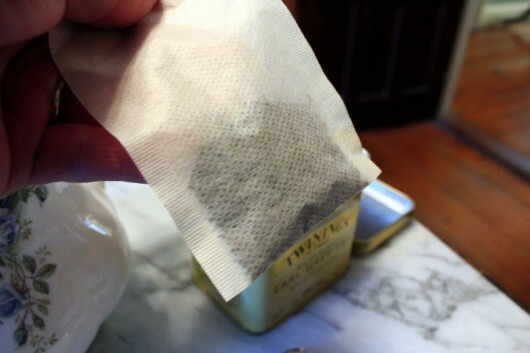 Because I could not find my tea-strainer today, I placed the loose tea in an unbleached tea-packet. Such packets are available at gourmet shops, kitchen-supply stores, and some supermarkets. They are handy indeed. How much tea to use? Well, traditional wisdom says to use one teaspoon per cup, plus one more for the pot. So that is the formula I use. You see, I’m a traditional sort of guy, especially when it comes to hosting a tea party. Let the tea steep for 7-10 minutes. Then remove the paper tea-holder. Shall we head into the parlor? I’ve just lit a fire there. As you can see, I’ve placed the 3-tiered stand at the center of the table, and arranged at each place setting a cloth napkin, a cup and saucer, and a small plate. There is a small butter-knife set atop each plate. 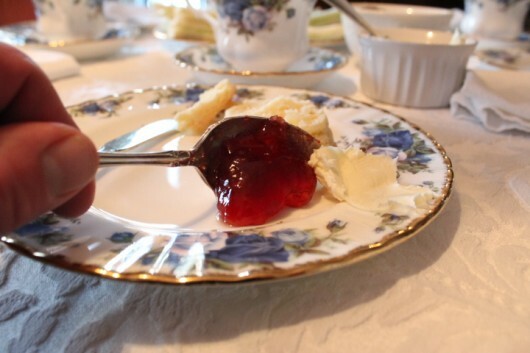 The knife is for spreading the cream and jam we’ll enjoy on our scones. Pictured above is the small ramekin of clotted cream. I obtained a jar of this delicious stuff from my local farm store. Why my farm store should sell clotted cream from England, I do not know. But I’m glad they do. You’ll notice that I placed a small knife in the clotted cream. 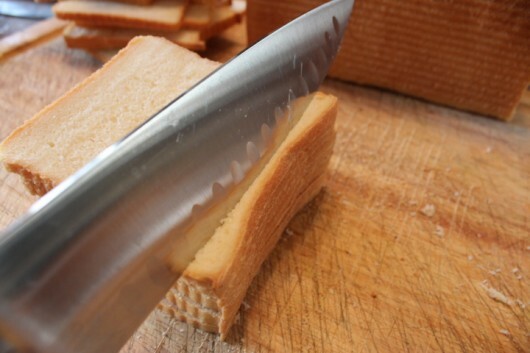 This knife is not for smearing cream on scones. I’ll explain its purpose in a moment. 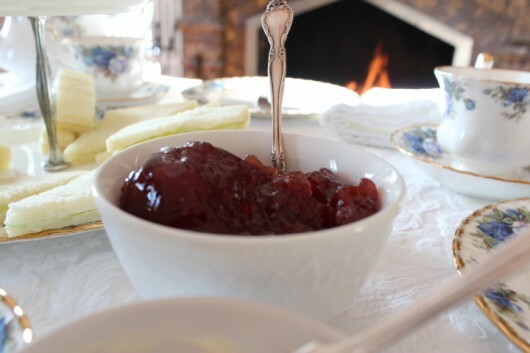 The strawberry preserves are in a small white bowl. And there is a spoon stuck in there. I’ll explain why in a moment. And here is the sugar for tea. I used raw sugar cubes, because…well, because raw sugar cubes are traditional. I set them in a small, pierced silver basket equipped with a glass liner. I found this little sugar-bowl at Camden Place in London. I did not set a pitcher of cream on the table, because I can’t bear the taste of cream and tea. Cream and coffee, yes. But not cream and tea. You might have a different opinion. Fact #1: Only the host (or hostess) is permitted to pour the tea. There is no reason for this rule. It’s simply…tradition. 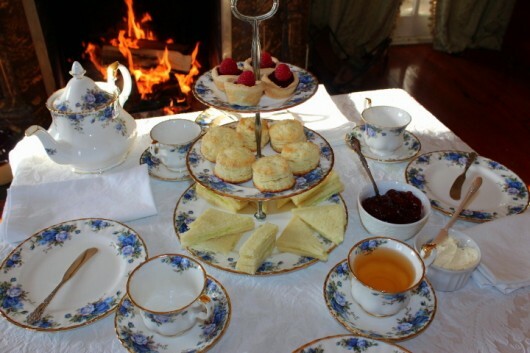 Fact #2: Afternoon Tea is not “High Tea.” High Tea is a full meal, at which meat is always served, but tea (I’m not kidding here) is entirely optional. Afternoon Tea, which is what we are enjoying just now, is a light repast, intended to tide us over before dinner is served. Scoop up a dollop of cream, and place it on your plate. Do the same with the preserves. 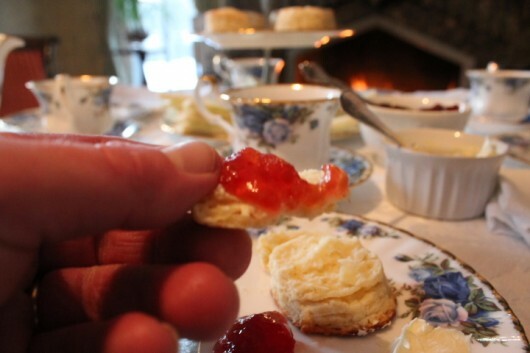 Then tear off a small piece of scone, and spread it with some of the cream and preserves you placed on your plate. Eat the morsel of scone. Tip #2: When you sip tea, hold the saucer in the palm of your hand. This is easy to do, and doing it shows the world that you have impeccable manners. And speaking of manners, you can forget all about them when you join me for Afternoon Tea. I don’t care how you eat your scones or sip your tea. Well. I hope you enjoyed our tea party as much as I did. Promise me you’ll visit again, okay? Thank you for briefly transporting me out of my office chair. I’ll bring the lemon curd! What keeps the cucumber sandwiches from getting soggy? I would guess the butter keeps the moisture from the bread. This looks like great fun! Maybe I’ll try it someday. I would especially enjoy it during these dark, cold winter days. Thank you for a wonderful break in my day, I love how you bring us all into your kitchen and home and I am much refreshed after such a lovely tea. My father in law (of 22 years) is from England and I decided to surprise him at Christmas breakfast with fresh made scones. After much research and many “almost” recipes I settled on the one I thought was the most authentic. I waited anxiously as every one enjoyed their meal to see if I had succeeded only to find out …he had never had a scone before. The difference in our recipes is buttermilk and a touch of cinnamon. We have fallen in love with scones at our home and I often give them as gifts at Christmas, they are so perfect after all the rich foods and super sweet treats. Thank you for sharing, Debby. 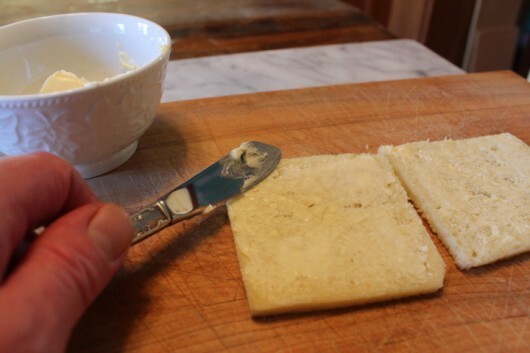 Suzanne – You are right — the butter seals the bread, and keeps it from getting soggy. This looks lovely Kevin! I would expect nothing less from you! Warm and inviting…..well done! Love your instructions! I’m planning an afternoon tea for friends for Valentine’s Day and it was nice to review your method beforehand. I have served many a cream tea in my time as my partner flies back and forth between Canada and London regularly so I have my own source of all things British. He is going to bring me some clotted Devon cream on his next return. Thank you so much for brightening up the day for me. I enjoyed this very much! Thanks for the invite. This was such a lovely tea! I guffawed like the commoner I am. I wish that we were neighbors. Kevin, your china is fabulous! Is it old? I adore high tea, especially in warm weather when my dear friend hosts in her lovely English-style garden. A great teapot and good, loose tea is a must. Thank you for the invitation! Thank you. This is the best post I have read in ages. I felt like I was there. I live in Sidney just north of Victoria BC. I haven’t been for a long time, but at the empress hotel in Victoria they pride themselves on their High Tea. Well now I know, it really isn’t High Tea. It was not a meal, no meat, rather an afternoon tea. Hi Kate – So glad you like the china. It is the “Moonlight Rose” pattern from Royal Albert. I purchased my set in London many years ago. But I think it is available in the U.S., too. Oh Kevin… we’re all invited, yes? Your presentation is impecable! And I thorougly enjoyed seeing the traditions of tea drinking in England! I want to eat many cucumber sandwiches right now! Oh, thank you so much!!! 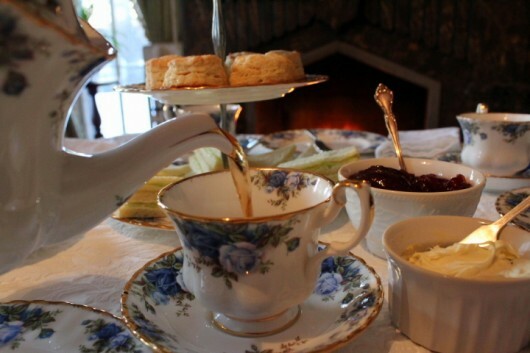 I have always wanted to have a real English tea, but not being English or having traveled to England, I never knew for sure what was really authentic and what was Americanized. So I will be saving this post for future reference!!! I just love this post Kevin! Thank you! I’ll definetly be hosting an afternoon tea once the weather warms up. can you do a contest and the winner can come to this tea? looks so inviting. I’d vote many times for it. I wish your lovely home was in my part of the country and I was one of your special friends. And I would hope you would invite me to join you for tea one day. Do you ever allow guests to bring goodies to add to the menu or is that considered an insult? I think if I had another life to live, I would love to be a pastry/dessert chef. I love making things sweet. Thanks for a glimpse into your home once again. I love this post. I am still in a fun spirit after reading it. What a joy you and your tea information has brought me. Thank you so much. I just love this tea post… I am a new subscriber and this is my favorite post so far! Just love your blog… it inspires me! How wonderfully elegant!! I would love to be there for tea with you!! Beautiful tea and I just love your beautiful Blue Rose service and china. 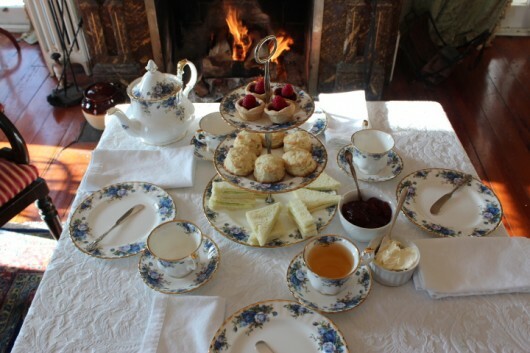 By the fire is an exquisite place to have afternoon tea. Thank you so much for the invite and info!! I’m feeling as close to British as I ever will! You have delighted us, Kevin, I almost expect a footman to come by any moment now with a tea refill. No, wait. I didn’t have a first cup yet. The scone recipe sounds heavenly. Alas and alack, can’t do dairy and I wonder if I’ll just have to make cashew ‘milk’ to try it because, no doubt, soy milk simply won’t do! For a long time I’ve felt there are two kinds of people in the world: those that love Earl Grey and those who detest it as tasting like soap. Though I fall into the latter category with a big splash, I am open-minded to my EG-loving friends and do not discriminate against them. In addition to Downton Abby, I’m reading, and loving, the Robin Paige mystery series set in late Victorian England. I can’t wait to do a real tea. Reading this was like taking a vacation! I’m addicted to your posts Kevin! Many, many thanks. I love all your pointers…palm the saucer, etc. What about fresh dill on the cucumber sandwich? Npw I am craving a tea party! Also, I love your table cloth. What table are you using? Just curious. so PERFECT! Amazing ! I wish I was your neighbor so you would invite me to have tea with you guys!! Thank you ever so much for such a lovely tea on such a cold day (there’s frost on the ground here). You’ve started my day in a most delightful way! Oh my goodness! Loved every word, picture and feeling this conjured up! Delightful! All the comments are wonderful too ! You are a master ! Beautiful presentation , thank you ! Thank you for afternoon tea. It was lovely. I remember as a young girl we would fairly often have tea and cucumber sandwiches. And scones were an important part of our life also.. It was at those times that my mother would tell me stories about Grandpa McInnis, her father and Aunts Edith, Jeananne and Pearl. She would tell me stories about her family who were from Great Britain (of Scottish /Irish decent) and how they “did things” ; how they “loved their tea and scones” etc; and what funny “sayings” they had. I loved hearing those stories. I spent the same type of special times with my father whose ethnicity was Rusin/Ukrainian. He would share his stories of his family. I learned so much and cherish those memories. What a delightful few minutes I’ve enjoyed with you just now. Thank you for the tutorial with detail and beautiful photographs. I will know what to expect and how to behave next time. Last week, my husband and I enjoyed tea at a small local shop, The Isles, in Reno, NV. We had never taken Afternoon Tea before. What a beautiful way to spend time with someone you care deeply for. 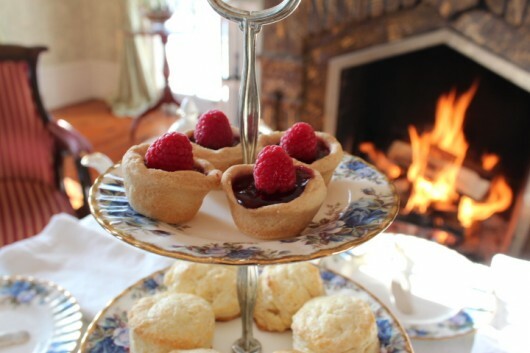 And true to form, the scrumptious scones were served on a 3 tiered plate. We enjoyed lemon curd, clotted cream, and raspberry jam with them. Scones with clotted cream and jam – Oooooh Kevin, what a delightful repast! I spent the past week in the hospital and believe me, your Tea was just what the doctor ordered. So nice to have you in mty life. What a wonderful repast! 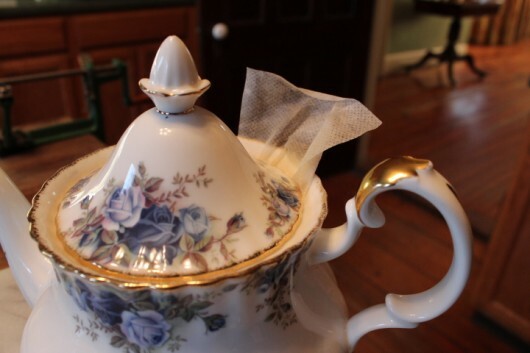 I do have my 3-tiered server and I only use a loose tea(Ambrosia is my favorite) but your darling, small, pierced silver basket with the glass liner is Charming! I will have to find one. Thank you for a lovely read. 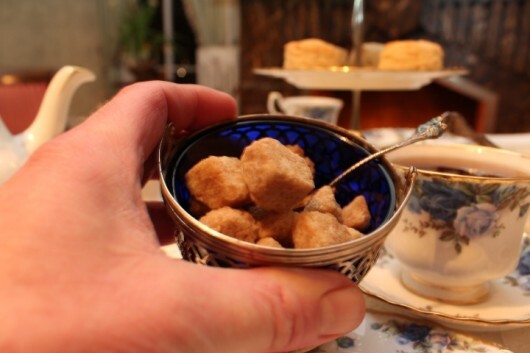 I might just try your scone recipe this evening when I have my tea and treats while watching Downton Abbey. Sunday nights are heavenly. p.s. – I wish there was a “like” button for the comments your readers leave. You have some wonderful comments here! 🙂 My very best regards to all. What a perfect sunday afternoon! Thank you for the pleasure. I think that I’m saving this post for future Sunday afternoons. It was lovely and so thoughtful of you! This is something that bears repeating :). Delightful! Thank you for brightening this dreary day! Looks just yummy, but I cannot wait to try your recipe for homemade English Muffins – they looked spectacular! Lovely as always. Thank you Kevin. Thank you for sharing with us Kevin, what a lovely tea! Such a delightful time for tea. I loved your post and your photos. Thank you! Thank you! Your explanation and photos are great. I put get a 3-tiered stand on my to do list this week. Thanks for this lovely tea party. 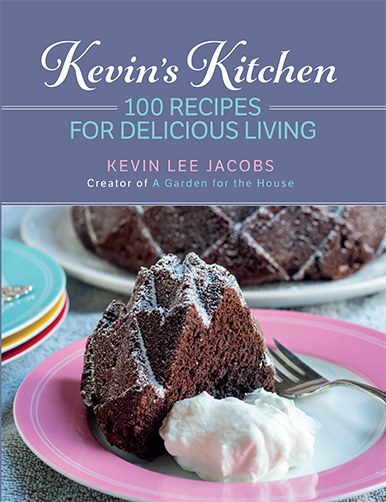 Great recipes and a warming bit of fun for a very cold winter’s day here. Oh Kate, you solved the mystery for me. I did not know . Just don’t pour tea. It is so much easier than the alternatives. Kate – Ha! I’m with Dori. Now the “only one person pours the tea” business makes perfect sense. Thank you. Had a wonderful afternoon with you at your lovely home. Thanks ever so much. I LOVE afternoon tea and I just recently purchased a 3-tier stand for the purpose. Your tea was lovely but missing my favorite component…..lemon curd. It is sooooo good on those scones with the clotted cream and since I have three lemon trees, I make my own. the Meyer lemons are particularly spectacular for this. I agree with Sarah, thank you for transporting me out of my office and into your parlor. What a delightful time I had! In thanks for the lovely tea, here’s a favorite tea resource – http://uptontea.com/. Their sampler size is just delectable. Where did you get your china set? I think it is beautiful. 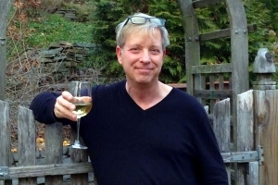 Hi Marcia – I purchased the pieces in London, but they are probably available in the U.S., too. The pattern is “Moonlight Rose” from Royal Albert (a division of Royal Doulton). What a wonderful tea. I remember a tea we put on at the Conway New Hampshire library. I made the cucumber sandwiches, and it was so much fun. I had always dreamed of doing something like that. I filled the whole center work space over and over. I also made little ham sandwiches too. It was all such a hit with everyone and raised lots of money for the library. It was so appropriate for that wonderful old building to host a tea. Thanks for all your recipes. Kevin, I am so very blessed to have found your site. Beautiful, just beautiful! My Jamaican mother-in-law would be so happy with your description of afternoon tea. She was always correcting us ill-mannered Americans about high tea vs. afternoon tea and many other etiquette discretions, One pet peeve was how Americans enter their homes on the side door rather than front doors…oh, there were so many! I already love your mother-in-law. And speaking of entrance-ways, when we bought this ancient house, previous owners had created a driveway that lead to the not-so-nice backdoor. We reconfigured the drive so that visitors are now directed to the infinitely more gracious front door — just as they were in the 19th century. I follow your lovely blog, and just re-found this wonderful post. 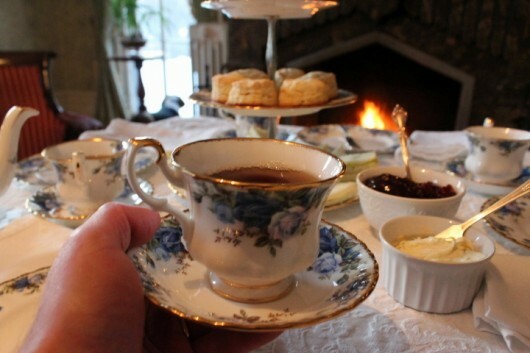 We celebrate Victoria Day in Canada, and since my name is Victoria, I always host Afternoon Tea. It’s a tradition that my family and friends look forward to each year, and come to Vancouver from far and wide. this isnt a perfect world–but your part of it seems to be…and how i enjoy it…b. Kevin, it’s the tannins in the tea that make cream in tea deplorable. I drink PG Tips and use only skimmed milk. You’ll never find a fat globule floating on top with skimmed milk. 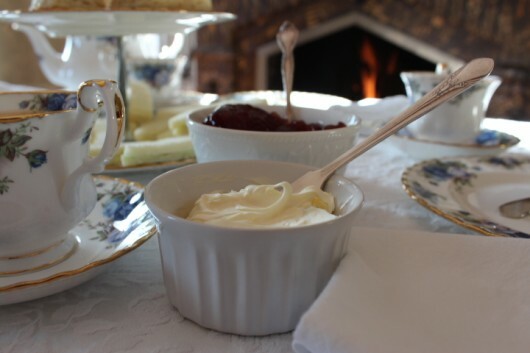 A British friend gave me this recipe for clotted cream years ago and it is Fab. Use a bain Marie to slowly and lowly heat a pint of heavy cream (recipe calls for double cream – a local dairy would probably have the best stuff). As the clotted cream forms on the top, just scoop it off and refrigerate. I use the depleted liquid for baking the scones – extra liquid freezes well for baking. Easy peasy and DEELISH! I thoroughly enjoyed your 20th Anniversary post and then found myself perusing your other posts from the past and my eyes popped open wide when I saw this one! I’m sure that I read it before and I have had an Afternoon tea a number of times. However, I plan to have one this coming October in celebration of starting a chapter of the Tasha Tudor Society in my own town! I will be making my 6th visit to Tasha’s home and gardens the weekend before and will be primed to meet the new members of my chapter! The Tasha Tudor Museum in Brattleboro, VT is encouraging kindred spirits from all over the country and the world to extend the joy brought about by coming to know Tasha Tudor and her amazing lifestyle no matter where you live! I am so excited to finally be doing this and a welcoming Tea (something Tasha adhered to throughout her 92 years) is the perfect introduction to Tasha’s world. Thank you for the pleasant reminder of proper etiquette and I assure you, I have numerous 3 tiered serving pieces to chose from (many of which I have made myself)! As always, thank you so much for your wonderful blog. It is always a treasure! Hi Susan – Nice to hear from you. I, too, am a fan of the late Tasha Tudor. Sorry Kev, can’t go along with the “high tea” explanation completely. 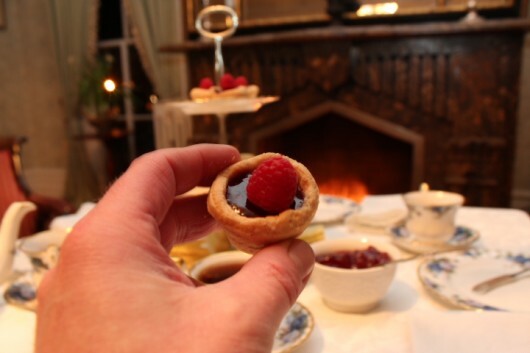 High tea has to include hot dishes (not necessarily only meat… can be beans on toast, welsh rarebit on toast, etc.) as opposed to afternoon tea which has only cold dishes (‘cept for the tea of course!). I’m ex-pat therefore have creds, and a mater who was terribly proper, don’t you know, so it must be so! Ps enjoying your blog. Will try the “chicken to die” for this week!